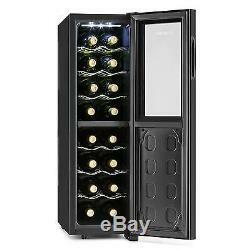 Klarstein Bellevin Wine Cooler Wine Refrigerator 45 Litres 16 Bottles 2 Zones. 45 litres for 16 bottles. Six removable metal inserts and LED interior lighting. 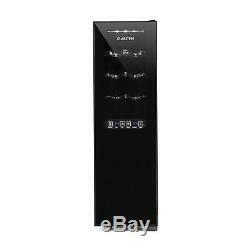 Glass front with LCD display including temperature display and touch control section. 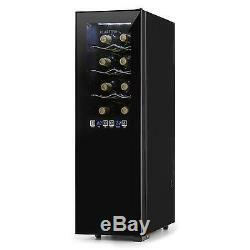 Quiet in operation, easy to clean and economical in consumption thanks to energy efficiency class B. Environmentally-friendly wine refrigerator with 45 litre capacity for 16 bottles. Six removable metal inserts and switchable LED interior lighting. Double insulated glass front with LCD display including temperature display and touch-sensitive touch control section. Two programmable cooling zones for different types of wine. 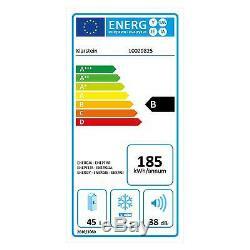 Quiet operation, easy to clean and economical in consumption thanks to energy efficiency class B. Temperature range 12 - 18 ° C (upper zone). Temperature range 8 - 18 ° C (lower zone). Ambient temperature range: 10 - 32 ° C.
Power supply: AC 220-240V, 50 Hz. 25.2 x 83 x 51.5 cm (WxHxD). Interior dimensions: 18.5 x 32.5 cm (W x D). Drawer: 19.2 x 29.2 cm (W x D). Cable length: 1.70 m. Weight: about 15.5 kg. English user manual (other languages: German, French, Italian,ish). 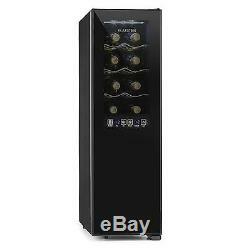 Wine refrigerator with two cooling zones and 45 litres for up to 16 bottles of wine. Convenient operation through easy-touch function keys and LCD display. Stylish wine storage over eight removable metal trays. The environmentally-friendly Klarstein Bellevin wine cellar is an air-conditioned residence for up to 16 bottles of your best wine. Enjoyment in every way: equipped with six removable metal drawers, it offers 45 litres capacity and room for a total of 16 bottles of different varieties of wine. The upper row can be seen from the outside and easily accessed via the glass windows. Keep your personal wine selection always in view. The cooling temperature may be adjusted between 8-18 ° C, allowing you to find the ideal drinking temperature for each type of wine. Two independent cooling zones allow the appropriate treatment of two different batches of wine. The Bellevin refrigerator is operated via a touch-sensitive touch control section, which includes an LCD display for showing the set temperature. 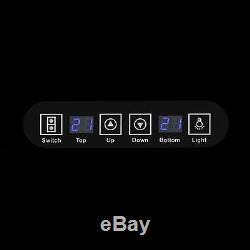 In addition to the temperature on the control panel, the device features top LED interior lighting that may be switched on and off. Through the elegant glass front, you can see and assess the vine juices within excellently without having to open the door, allowing you to always find the right wine. The elegant design fits well with a dignified ambience. Thanks to its high presentation factor, it is also suited for installation in bar areas of hotels and gastronomic establishments. The Klarstein Bellevin wine refrigerator (also known as a wine cooler) gives you the perfect combination of storage and refrigeration, thus guaranteeing that the perfect wine can always be served for any occasion. This device is intended exclusively for storing wine. 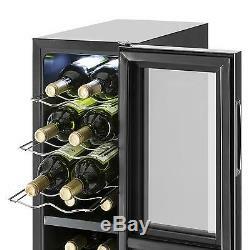 The item "Wine Cooler refrigerator fridge 45 litres Cooling 16 bottles LED Lighting glass" is in sale since Thursday, November 9, 2017.